We’d love your help. Let us know what’s wrong with this preview of Hello, Door by Alastair Heim. In this ode to the classic "Goldilocks and the Three Bears" story, kids can follow a thieving fox as he greets everything he sees in a home that isn't his. He co In Hello, Door, kids can follow a thieving fox as he greets everything he sees in a home that isn't his. To ask other readers questions about Hello, Door, please sign up. The simple text of a fox as he sneaks into a house through a window then begins to gather up various items and stuff them into his sack. A bit like the Grinch when you think about it. Only he isn't caught by a little girl, but the family of bears who live there. After being tossed back out the window (and saying goodbye to a few items) he greets a new door at a new house. the illustrations are where the magic is at. You can see the pleasure the fox is taking in playing with items as he gathers t The simple text of a fox as he sneaks into a house through a window then begins to gather up various items and stuff them into his sack. A bit like the Grinch when you think about it. Only he isn't caught by a little girl, but the family of bears who live there. After being tossed back out the window (and saying goodbye to a few items) he greets a new door at a new house. The text follows the rhythm and beat of Goodnight Moon, and the concept mirrors that of Goldilocks and her Three Bears, so thankfully the illustrations feel unique and distinctive. I'm not a fan of the story, simply because I'm not sure what the child is to do with this determined, thieving fox who seems to go from house to house robbing people... Is that funny? The illustrations are darling--the illustrations are funny, and make you want to read the story more than once, but I was sort of think The text follows the rhythm and beat of Goodnight Moon, and the concept mirrors that of Goldilocks and her Three Bears, so thankfully the illustrations feel unique and distinctive. I'm not a fan of the story, simply because I'm not sure what the child is to do with this determined, thieving fox who seems to go from house to house robbing people... Is that funny? Loved the illustrations and the humor (4 stars for that), but it needed a different ending, where the fox was disciplined for his crimes. Instead, the ending suggested that he would keep repeating the robberies over and over without any consequence (so 1 start for that). Poorly chosen ending that was unsettling and I think it sent a bad message. My niece, however, didn’t notice this and loved it. So overall, I’ll land on 2.5 stars. Funny! Sparse text, the story is in the illustrations as a sneaky fox cleans out a house while the owners aren't home. He gets distracted, saying hello to each new object to covet, and doesn't get out of the house in time before the inhabitants - the bears! - come home. At that point, Goodbye Door! The rhyming text is well done, and children should love pouring over the illustrations to read each important detail. This was a fun book with great pictures and and short rhyming story. "Hello, necklace. Hello rings. Hello, other sparkly things!" This would be great for a storytime, or bedtime. It's good for a giggle. I think that the house belongs to the 3 little bears. In the end the fox still does not learn his lesson after being caught by the Bears. Which makes it even more funny. You could do a crafty thing with something sparkly. A thieving fox greets everything he sees as he prowls through a house. Each page contains great detail and stories within stories. Easy to read, simple rhymes make this a fun read aloud. When he is discovered by the three bears that live there he continues to say hello to the floor, window, and nice new neighbourhood he is dropped into. 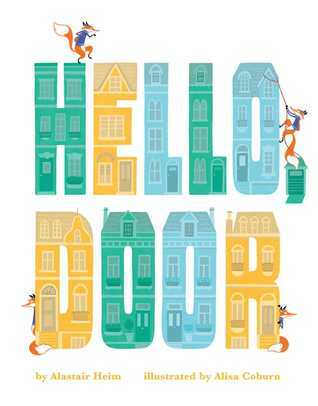 Run, don't walk, to spend time with Alisa Coburn's illustrations in "Hello, Door". Her Georgian style and purposeful, pastel palate breathes life into Heim's text, which is a riff on the tale of Goldilocks, save for a thieving fox. The story is on the sparser side, but there are a few fun quips in the phrasing. Light footsteps leads Fox to the Bear's front door, but the family is not home. Fox improvises to keep himself busy by examining each and every valuable article within the home until he is caught red-pawed! This humorous picture book is such a delight and in the end, all is well with a happy ending and new beginnings. The illustrations in this book are gorgeous and fun, and it's perfect for beginning readers and for reviewing items in the house. "Hello, door; hello, floor." The pictures really tell the story, which is especially fun for ELLs. The clever fox in this story thinks he has it all figured out. He plots his way through a house, ready to selfishly steal all the things. Will he get caught? The color palette and illustrations are what really shine, in my opinion. I like this book, a lot. It was funny watching the fox say hello to everything, and then he swathe owners of the house. I don't want to ruin it, but I would defiantly read this for another story time program. Oh that was adorable! And quite amusing too. Title doesn’t do it justice though, I wasn’t even going to pick it up, until I was bored and happened to read the description. A better title would have made it more intriguing. MORE, MORE, MORE! 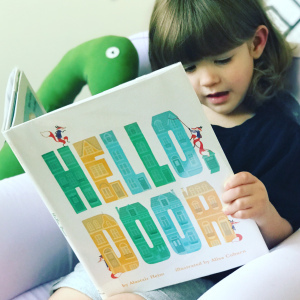 Not only did my two boys want to read HELLO, DOOR over and over but I couldn't get enough! Heim's text and Coburn's illustration come together and make each page turn a delightful surprise. A cute new take on the goldilocks-and-the-three-bears troupe, only this is about a house-burglaring fox. Neither the story nor the illustrations blew me out of the water, but it was worth reading. A thieving fox tiptoes his way through an unoccupied house saying, "Hello," to ever item he encounters. 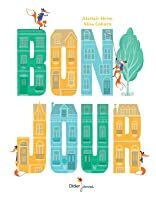 Want to build vocabulary in a whimsical way- this is the book for you! The repetitive nature of this tale, with a touch of a Goldilocks theme, is sure to entice a participatory reading time. unique story to teach very young children the names of everyday objects. and of course I love the interpretations of famous works of art. A sneaky fox goes through a house to say hello and sneak out goodies. A quick read with rhyming words. This is the kind of book that would have made me paranoid as a child of burglars. But I was a pretty paranoid child, so. This is a great one to see what story the kids can pick up from the illustrations while you're reading the words. Adored this one. Very clever for storytime. Goodnight Moon meets Goldie Fox and the Three Bears. Fun! Very simple text. Spend a lot of time enjoying the story that is in the text. A sneak theif fox greets all obstacles and valuables with a cheery Hello! The art is fantastic and the slightly snarky tone is fun, but as other reviewers have mentioned, the ambiguous message at the end leaves me wondering if children would actually enjoy this story. I am a dad to three lovely kids and one lovely wife. I am also the children's picture book author of LOVE YOU, TOO (Little Bee Books), NO TOOTING AT TEA (HMH/Clarion), THE GREAT PUPPY INVASION (HMH/Clarion) and HELLO, DOOR (Little Bee Books).